Join the discussion on our forums! Come discuss Mulchmuncher over in our dedicated Mulchmuncher discussion topic. This is bound to be played and likely very good. One Living Mana or Soul of the Forest will likely bring this down to 5 mana and a 5 mana 8/8 with Rush is insane. Historically speaking any card that has it's cost reduced in hand or deck has seen play. All of the giants, Thing from Below, Kabal Crystal Runner, Crystal Lion, Corridor Creeper, and even Nerubian Prophet. I don't see any reason this card will break that pattern. Needs a little more support but can be very good. I can see this going in a token druid with soul of the forest. Still needs more good treate cards. So as of now it's not that great but it can be very good in the future if there are good cards that generate treants. It needs more support? All you need to do is play a Living Mana and it's a 5 mana 8/8 with rush and no drawback. The second copy is likely to be a 0-mana 8/8 with rush, and this only requires 2 treant synergy cards during the course of the game - that's it. What more support are you talking about? This has corridor creeper written all over it, and you don't even need the card in your own hand when you play the mass treant spells, which makes it a WAY better topdeck than Corridor creeper ever was. Really, have we forgot so quickly just how good mana reductions are? It's an 8/8 rush for 5 or 0 mana!!! It's not big and flashy, and it's not legendary, but it definitely is in the top 2 druid cards this expansion. This card is so under-valued right now. Whispering Woods/Spreading Plague/Soul of the Forest is already a thing. So you have a Tier 1ish deck. Token Druid. With an OTK from hand finisher. It could be pretty oppressive. Rush not charge bro, read the text. Looks great, at least it will be like the mountain giant or magma giant, you just need a lot of treants for this one. I mean.. that would require you to have a full board with either of those cards then to get them killed THEN to have the treants killed from soul of the forest. Only really warrior and warlock can reliably do that. If you already have 7 treants on board then you've already likely won at that point playing token druid. Why would you ever handicap that deck to play something just inherently worse? Yah, I forget Charged Devilsaur was a proto rush card so it is worded differently. The full board of treants is actually VERY easy to achieve. Play Token Druid. You pull that combo off one way or another every game, and there are more Treant cards. Insane synergy with Splintergraft. 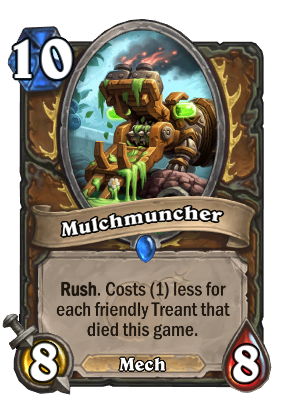 If enough treants die to lower the cost of this card to 0, it will be possible to copy it with Splintergraft and place the 10/10 copy on the board immediately. Since it has Rush, it is going to impact the board immediately as well. Pretty strong combo. It creates druid new druid archetype so it looks cool, at least on paper. I'll gladly try some forest Furion. Card is broken because of oaken summons. Crazy powerful in wild if you are running Poison Seeds + Starfall board clear combo. they better change the wording of Living Mana to "treants" instead of "minions"
I know they're encouraging Treant Druid, but really people are just gonna be running the already frustrating Druid decks but now with a legendary Flubber.